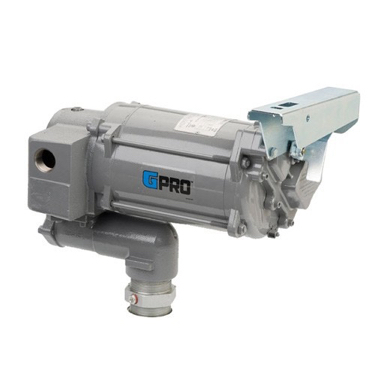 GPI GPRO professional grade fuel transfer pumps have an impressive 35 GPM flowrate for stationary tank applications. Ideal for fleet, agriculture or industrial applications. Engineered for high performance and longevity, the PRO35 gets the job done fast and efficiently. Extended Duty Cycle exceeds the industry standard. Weight centering inlet base includes pressure relief and easy strainer access. Field replaceable switch and vanes. Tank Adapter included. Thermally protected motor. Vacuum Breaker Ready. Extreme Temperature Series (XTS) models available. Recommended Use: Gasoline (up to 15% alcohol blends such as E-15), diesel fuel (up to 20% biodiesel blends such as B20), and kerosene.